The 2019 Vic Open will feature world-class players from 41 countries with a strong Australian contingent competing at the European Tour co-sanctioned tournament that boasts an impressive prize pool of $3 million split evenly between the men’s and women’s tournament. The tournament gets underway this Thursday at the 13th Beach Golf Club layout south-west of Melbourne. The European Tour, PGA Tour of Australasia, the LPGA and Australian Ladies Professional Golf are all sanctioning the event. There will be 315 players descending on Geelong this week, so it makes sense that play is split between the two courses at 13th Beach Golf Club – the Beach and Creek courses. The Creek Course will be in play for the first two days of competition only. A 36-hole cut will reduce each tournament to the top-65 players and ties and send both competitions to the Beach Course, before a 54-hole cut once again reduces each field to the top-35 golfers and ties for the final round, again on the Beach Course. Support for the event has come from the Victorian State Government, the City of Greater Geelong, ISPS Handa, and the Transport Accident Commission. Now part of the Race to Dubai, the Victorian Men’s Open will feature many notable names from the European Tour. In addition to Major Champion Geoff Ogilvy, the likes of Ryder Cup winner Nicolas Colsaerts, Matteo Manassero, the youngest winner in European Tour history, and British Masters and GolfSixes winner Paul Dunne will compete. They will tee up alongside locals and recent European Tour card holders Lucas Herbert, Jake McLeod and 2017 champion Dimi Papadatos. 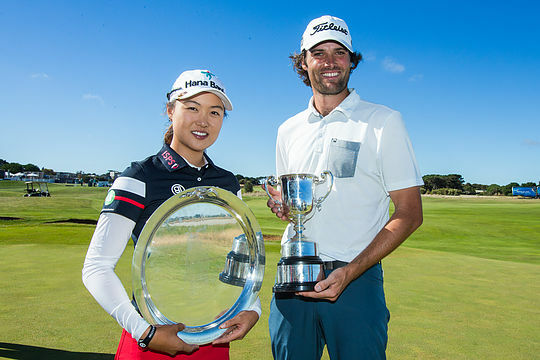 Australia’s top two male amateurs David Micheluzzi and Blake Windred will be joined by Victorian Junior Open winner Min A Yoon and last month’s Australian Master of the Amateurs champions Ireland’s Conor Purcell and Korea’s Yae Eun Hong. Following world number 9 Brooke Henderson’s withdrawal due to illness, the women’s Victorian Open will feature four of the top 50 in the Rolex Women’s World Rankings with No 6 Minjee Lee, No. 8 Georgia Hall, No. 22 Charley Hull and No. 41 Pernilla Lindberg all competing. Joining them as headliners are Hall of Famers Karrie Webb and Laura Davies, along with Paula Creamer, Catriona Matthew and Morgan Pressel. The Victorian Open dates back to 1957 and has been won by the likes of Gary Player, Peter Thompson, Greg Norman and Ian Baker-Finch across the years. The tournament has been heralded in recent years for including both men and women and for having the same prizemoney on offer for both events – a first in the world of golf. The Victorian Open is followed by the $1.6 million World Super 6 tournament in Perth (February 14-17) and the $1.2 million New Zealand Open starting February 28.